Editor’s Note: All opinions expressed by Alex Labidou are solely his own and do not reflect the opinions of the Brooklyn Nets or the team’s Basketball Operations staff, parent company, partners, or sponsors. As Nets approach the draft and free agency, one thing is clear: There’s plenty of interest from Brooklyn’s fans about what’s next. The first-ever team mailbag received dozens of questions. Not every question was answered in the first round, but don’t fret, this will be a weekly feature on BrooklynNets.com. So check in each week and I’ll try to address as many questions as I can. Labidou: Over the past two summers since Sean Marks’ arrival, Brooklyn has extended top dollar offer sheets to players who the organization felt it can build around. I don’t think that approach will change as Marks himself alluded to it in his end of the season presser. Labidou: D’Angelo Russell has incredible potential, but he needs to work on consistency to take the next step. The one thing that really impresses me about Russell is just how easy he makes everything look. Whether it’s a pull up jumper or a stunning behind-the-back pass, it all looks natural and instinctual with him. Russell appeared to be putting together what was a borderline All-Star campaign (averaging 20.7 points, 5.7 assists and 4.7 rebounds) before his knee injury derailed him for 32 games. Once he came back, he had to readjust and couldn’t consistently find his rhythm. With another training camp and the well-known Year 2 effect in Brooklyn, I think there will be plenty to be excited about. If he can improve his decision-making and defense, Russell can emerge as one of the top young point guards in the NBA. Labidou: Haha…three years is a long time. What I will say is I think the target of Marks and Kenny Atkinson is to keep improving each season and developing talent. Hopefully, the team will have a young core that it can build around and there’s already several players on the roster who you can point to in that respect. Finally, there was an eight-win improvement last season, so the expectation is to keep replicating that progress each season. 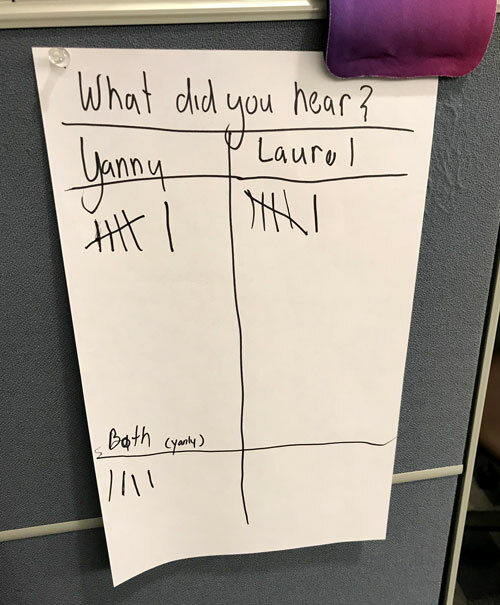 Labidou: Dude, I listened to the clip an embarrassing amount of times and all I hear is Laurel. Does that make me weird? I also sparked an internal office debate about it [Pic below]. Labidou: What Swamp Dragons? Wink…. Labidou: Oh man, this is the toughest question of the bunch. Heck, in DeKalb Market, I’ve probably got like at least three options I could say. But recently, I’ve been a big fan of Ends Meat. Their BeefNeck Sandwich is legit fire and the Hog Father is what they are known for. Definitely my favorite for now.